Honda’s Super Quiet Series generators feature a totally enclosed body that results in noticeably quieter performance. Designed for the ultimate in quality, portability and convenience, these models are perfect for any trip to the great outdoors. All of the Super Quiet generators have ultra-low noise, making them ideal for camping, RVing, home backup, public events or any situation where quiet operation is critical. 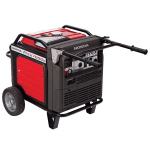 Honda’s advanced inverter technology makes the EU model generators extremely lightweight and portable. EU models also boast great fuel efficiency thanks to the Eco-Throttle™ System, which enables the engine to run only as fast as needed for any given load. With 3000 watts of super-quiet power and at only 18 lbs. tow weight, the recently developed Handi EU3000i is a portable power source that’s handy to take along almost anywhere. The top-of-the-line EU series model is the powerful EU6500is. Features include Inverter Technology, Eco-Throttle™ and a triple chamber design for super-quiet operation. This EU generator is our most powerful, versatile and technologically advanced generator yet.